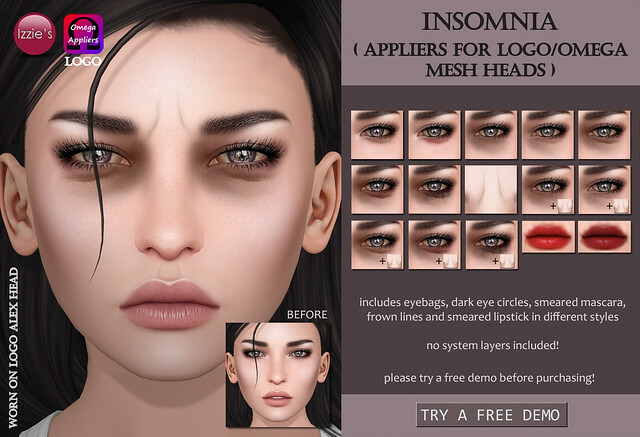 Izzie’s is offering Dry Skin Patches make-up in 4 shades including appliers for Catwa, LAQ, LOGO, LeLutka mesh heads and system tattoo layers for the TLC “Winter Solstice” round. A dry skin mesh layer (cheeks/nose) for LAQ and LeLutka heads is included as well. Please try a free demo before purchasing! 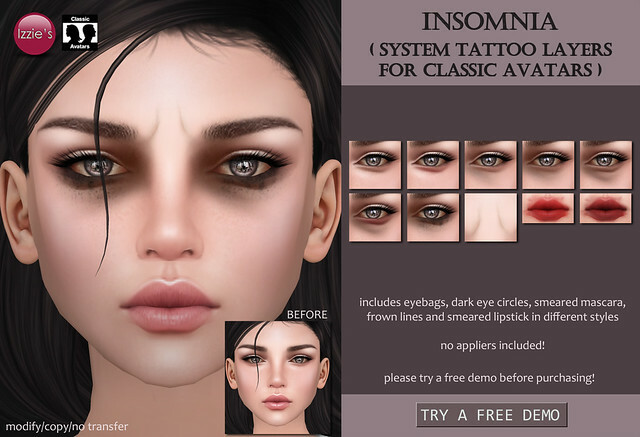 Izzie’s is offering Insomnia make-up including dark eyecircles, eyebags, smeared mascara, frown lines and smeared lipsticks for the TLC “Darkest Fantasies” round. 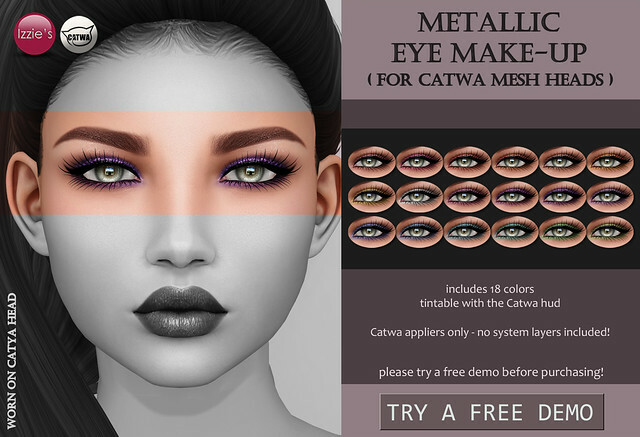 You can choose from Catwa, LOGO, LeLutka and system avatar sets, a full pack is available as well as a free demo. Izzie’s is offering Knee Wounds for the TLC Endless Summer round. The set includes bruises, scrapes, blood and bandaids on knees and come in 3 shades for light – dark skintones. System layer tattoos are included as well as appliers for Maitreya, Slink (tattoo + underpants) and Belleza mesh bodies. A free demo is available. 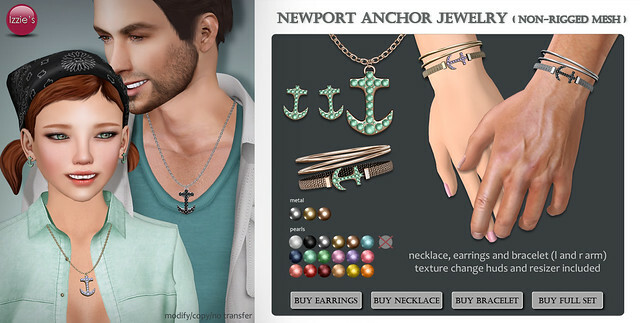 Izzie’s is offering a Newport Jewelry Set for the TLC Newport round. The set consists of anchor earrings, bracelets and necklace (male sizes are included). You can choose to buy each piece of jewelry separately or get a full pack. Resizer and texture change huds are included, choose from 3 metal colors and 18 pearl colors. Izzie’s is offering a Petal Eye Make-Up set including petal mesh lashes and glittery tattoo eyeshadows at the TLC “Bloom” round. The lashes are modify/copy and texture change via hud – choose from 23 colors. 17 matching eyeshadow colors on tattoo layers are included as well, on the lashes hud you will see which eyeshadow color works with the eyelash colors. The lashes won’t work for everyone, please try a free demo before purchasing.